On the 2nd of Apri,l 2018, Mr. 2Kay will flag off a singing/dancing competition where he’ll be giving away $2000 (two Thousand Dollars) to 2 persons in Port Harcourt. According to him, the initiative is a way of giving back to his starting foundation in the music industry. “Call it my little way of giving back to a place where I started my career. The support from the South has been superb from the people. The winners of the competition will also have the opportunity to share the stage with me during the elevated concert,” 2Kay says. To participate, interested fans are expected to post a minute video of themselves singing or dancing to their favourite song from Mr. 2Kay’s latest album – ELEVATED. 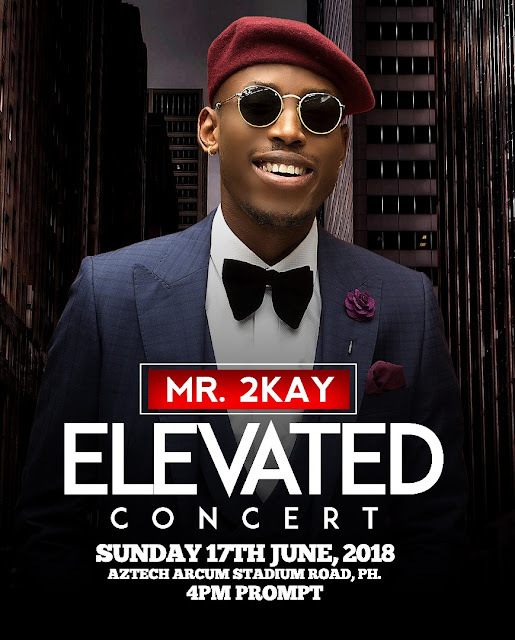 The videos are to be posted using the hashtag #ElevatedConcertph18 and participants must be following Mr. 2Kay on Twitter (@mr_2kay), Instagram (@mr.2kay) and Facebook (@iam2kay). Media partners for this competition are Rhythm 93.7FM PH and Beat99 FM PH. They will be dishing more details and updates on a daily basis on the competition.